Get the best of the Episode I: The Phantom Menace in this super deluxe Darth Maul costume! 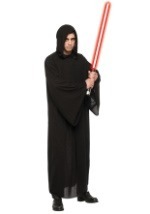 The licensed costume is perfect for Halloween or a fan collection. It includes a latex, character mask that is secured in place with an elastic band. The face features slits for the eyes, nostrils and mouth. The black, long-sleeved tunic has an attached hood and scarves that hang in the front. A black, rubber belt wraps around the waist and the black pants have attached boot tops (please note the boot tops are not screen printed as pictured). The pants also have an elastic waistband. 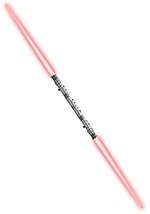 Prepare for battle with the Jedi when you add our Darth Maul dual lightsaber!